EXCITED is an understatement if we are to describe our feeling waking up knowing that we will go on with our trip around Hong Kong. It’s our first time in this part of the world and we can’t wait to discover it on our own. 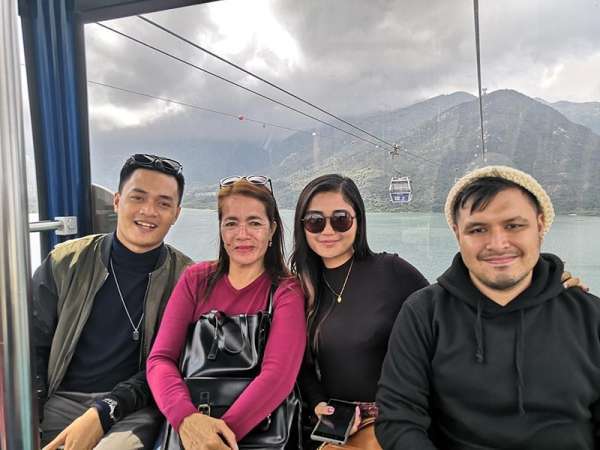 For the second day of our trip, we decided to bring our travel souls to Ngong Ping 360 degrees ride on a cable car and hike to the big Buddha – Tian Tan Buddha. We originally planned to visit Ngong Ping on our fourth day here but we decided to do it on March 5 after knowing that the cable car service will be suspended temporarily starting March 6 to 26 for maintenance. That is the beauty of doing a Do-It-Yourself (DIY) trip, you can change plans even up to the last minute. Our experience in Ngong Ping, Lantau Island is one of the highlights of our journey. When I was young, I can only see on TV - mostly on Karaoke screens - videos and photos of cable cars. And finally, I get to experience a ride inside it which felt surreal. We enjoyed the 25-minute cable car ride between Tung Chung Town Center and Ngong Ping Village on Lantau Island. 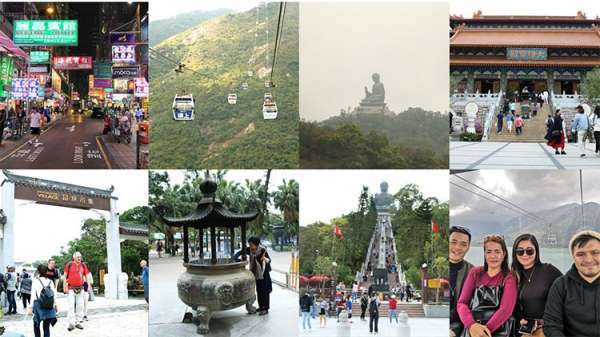 The experience was made special because of the visually spectacular views over Lantau island, the airport, seascape, Hong Kong-Zhuhai-Macao Bridge, and the 1.5-hectare Ngong Ping Village. After the cable car ride, a Chinese community of Ngong Ping Village will welcome visitors with Chinese cultural elements and an array of restaurants and shops. But the must-see and most arresting attractions when in Ngong Ping is the 112 ft. tall Tian Tan Buddha, the tallest outdoor bronze-made statue of a seated Buddha. To complete your visit to the center of the Buddhist faith in Hong Kong, climb through some 240-step stairway to get a close encounter with the Buddha statue that is sitting on an enormous lotus throne. Descending from Tian Tan Buddha, you can see just across the Po Lin Monastery, the Buddhist World in the South. Considered the most significant Buddhist Sanctums in the region, the monastery is ornamented with concrete benches, giant joss sticks, and censers. I visited the monastery and I got to see a couple of individuals holding incense and offering prayers to three bronze Buddha statues inside the temple. Another attraction that you can visit while in Ngong Ping is the giant wooden steles of the Wisdom Trail. If you are staying at Tsim Sha Tsui, just walk to Tsim Sha Tsui MTR station and take the Tsuen Wan line, stop at Lai King Station to transfer to Tung Chung Station. Take the Exit B and walk for approximately five minutes to Tung Chung Cable Car Terminal. After our day tour in Ngong Ping and a short rest in our hotel 9you’ll need it, promise), we decided to spend the night in Mong Kok. While posting stories on my social media accounts, a lot of my friends messaged me to try Mong Kok, so I heed their suggestions and happily explored the area. It is busy and crowded. People – locals and tourist – flooded the area making it so alive even at night. It is indeed the largest outdoor shopping destination in Hong Kong. 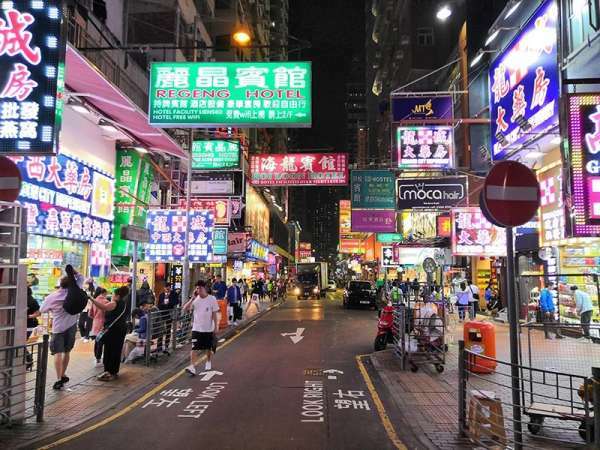 We just walk around under bright neon lights and headed directly to Ladies Market in Tung Choi Street in Mong Kok. You’ll be greeted with outside stores selling all sorts of products – bags, shirts, mobile phone cases, decors, and souvenir items, among others. If you plan to bring some goodies home to your friends and families as pasalubong, this is a good place to shop. We bought here our pasalubongs (ref magnets, shirts, bags, etc) and you can actually get the items for half the introductory prices if your bargaining skill is that good. We also bought our winter jackets here since we forgot to bring some. See you on our Day 3 adventure at the happiest place on earth – Disneyland Hong Kong! If you are from Tsim Sha Tsui, you can actually walk for about 15 to 20 minutes. But if you want to take the MTR, take the Tsuen Wan line and stop at Mong Kok station, travel time is just some 5 minutes.